We are a ‘Network economy’ (Kelly 2008) choosing to access our content online more and more these days rather than through legacy media formats. It is clear that once something is uploaded to the internet it takes on a life of its own and it is forever copied and downloaded for consumption. In April this year (2015) the first four episodes of Game of thrones season five were leaked onto multiple pirating bays by a few members who had been given early access to the shows for the purpose of reviewing them. This came 24 hours prior to the release of the first episode on Foxtel who had bought sole airing rights in Australia for the TV series. However pirating of the show only really took on real momentum once the news hit main stream and social media. After the news was out torrenting sites saw a massive influx of people downloading the first four episodes. Many of these people, like myself, unable to watch the show otherwise unless we wait for the box set to be released well after the show finishes. 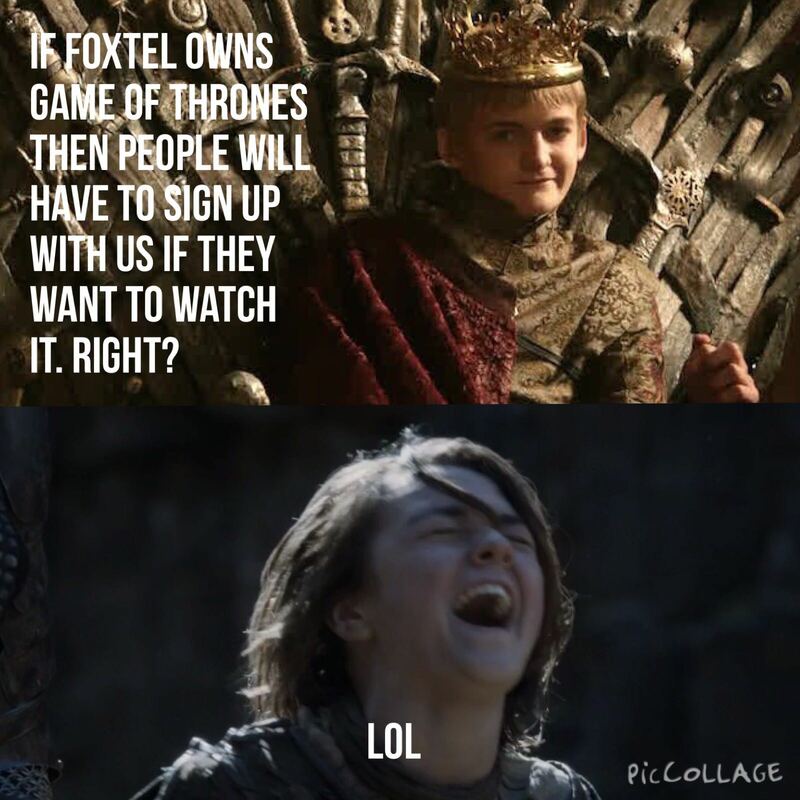 The main argument for people choosing to download the show (like many other popular shows) is often due to the delay in the to shows air time compared to the U.S., but also the cost involved in signing up for a subscription to Foxtel in order to watch the show, or to buy the box set once it is released. However despite the fact that there was a leak in the GoT season 5 popularity Foxtel still chose to release the first episode as scheduled and those unable to gain access to the leaked copies were able to view the show at the same time as in the US.If you want to read a little more on this I suggest having a look at Torrent Freaks brief article explaining what happened in more detail. “However despite the fact that there was a leak in the GoT season 5 popularity Foxtel still chose to release the first episode as scheduled and those unable to gain access to the leaked copies were able to view the show at the same time as in the US.” This just goes to show how stubborn the legacy media giants are when it comes to their customers.